Umbrellas, rain boots and heavy-duty windbreakers were being put to work late Wednesday and Thursday morning as a strong storm entered the Bay Area with gusty winds and plenty of rain. Widespread rain was expected to continue throughout Thursday, forecasters said. A cold front moving in will provide at least a slight chance of thunderstorms across the entire area through Thursday morning and into the afternoon, the National Weather Service said. Thunderstorms will have the potential to create lightning, heavy downpours, small hail, and gusty winds. As of Wednesday morning, high wind watches were in effect for all Bay Area counties except Solano County, which was under a wind advisory. The weather service warned that gusty winds could blow between 25 and 40 mph. There is also a high surf advisory in effect for Marin, San Francisco, San Mateo and Sonoma counties, according to the weather service. Westerly swells could top out anywhere from 13 to 16 feet while breaking waves could soar to about 24 feet. The strongest storm of the week will arrive early Thursday morning and last into the commute. Chief Meteorologist Jeff Ranieri has more on the timing of this storm and another chance by the weekend in you Microclimate Forecast. 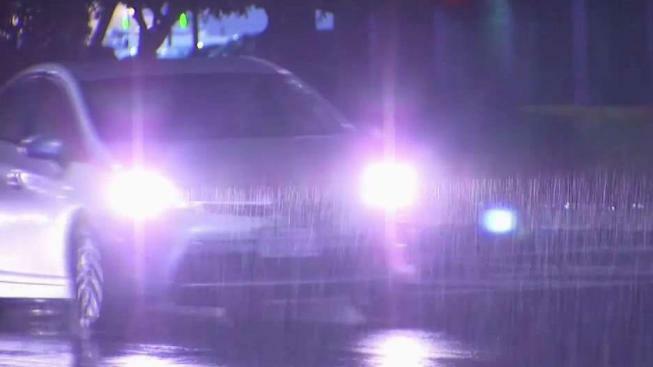 Waves of rain this week could deliver anywhere from 3 to 6 inches of rainfall to the coastal mountains across the Bay Area, according to the weather service. Most other locations are forecasted to pick up 1 to 2 inches by the time Friday rolls around. Crews in San Francisco have been busy clearing out storm drains and installing flood barriers in low-lying areas of the Mission District. Meanwhile, sandbag stations in the South Bay are stocked for people who need to divert rain water. Motorists are advised to keep an eye out for ponding and flooding as well as rocks and other debris on the slick roadways. A break in the rain is expected on Friday, but showers will likely return on Saturday.